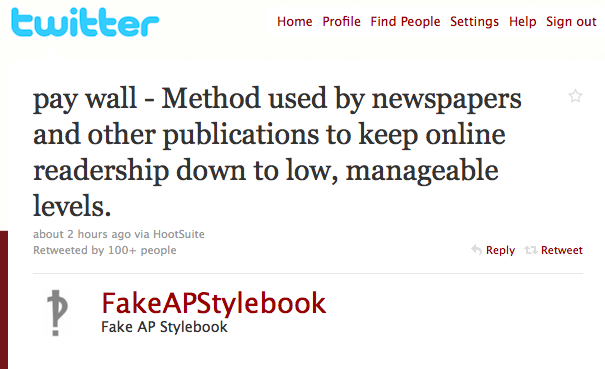 I had to share this Tweet®* from FakeAPStylebook. I like their definition for pay walls. But perhaps that is the best way to monetize news websites that specialize? Those who think it’s the way to go don’t care so much if the number of page views plummet, as long as the willing handful pay up. In some ways, pay walls are elitist. Aren’t we supposed to be informing the citizenry so this can be a stronger democracy? * I don’t want to get a cease a desist letter from Twitter, claiming I infringed on their trademark, hence the capital T on Tweet. But why do they even get to register it, anyway? Previous Post Who is Eben Moglen?